Minimalize. Declutter. Organize. Offload. Tidying. The blogosphere is abuzz with tips and tricks on how to get rid of "stuff" in one of the latest lifestyle trends. Who doesn't want to be tidy? I am all for getting rid of unnecessary stuff that brings no joy to your life (to borrow a little phrase from Marie Kondo (no, I actually have not read her book). When I think of being tidy it makes me feel good. Everything clean. Everything tidy. Everything in its place. On the other hand, when I hear "minimalist" I start to feel like this is the virtue-signaling of domestic dudes and divas. There is nothing wrong with having stuff. There is nothing wrong with having very little stuff. The trick is to find the equilibrium point for you and your family and then to not feel guilty about it. If you have kids, you know how hard it is to not accumulate stuff. If I go down to my storage room I have about 12 bins (4 years and multiple sizes) worth of little boys clothes, toys, and necessities. Why? Because they are being handed down from one son to the next. When I know that we are done having kids - GOODBYE BINS - oh that will be such a great day for decluttering, and such a sad day for this mom, knowing that there will be no more little ones in our house to wear the one piece snowsuit, or Blue Shark tilly hat I love so much. Wait, where was I? Oh YES......getting rid of stuff. but have you ever considered a curbside giveaway? This week, I traveled to York Region to pick up some materials for our renovation and I saw some very cool signs posted around advertising a Curbside Giveaway Day. What a great idea! I love this. Residents are asked to put out whatever they are getting rid of (not garbage!) with a sign marked "FREE" by 7am on Curbside Giveaway. That's it. Presto. You can browse the neighbourhood and take what you need, then at 5pm residents are asked to remove any leftover items from the curbside. The town provides a list of way to dispose of any remaining unwanted items. I love this because it is so simple, so straightforward, so FREE. This is a community building activity. 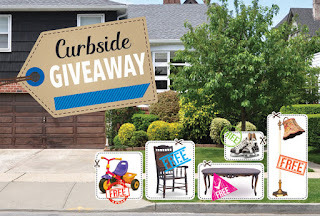 If you have a bunch of things you are looking to get rid of, why not consider organizing a Curbside Giveaway day in your own neighbourhood or community? Some years ago, I lived in a city that had a yearly curbside day, and loved it. I remember getting a potting bench one year. I next lived in a rural county that had covered areas at all the dump sites for people to put things that were still useful, and you could take anything for free. I also thought that was also a great idea, and a way to keep things out of the landfill. Yes - it really is like the cliché, one man's junk is another man's treasure. Sometimes you just don't need something anymore, but someone else could put it to good use and keep it out of the landfill. A great idea for sure. When I lived in Nova Scotia, a curbside giveaway day was a thing. Actually, I think it was a large-items-hauled-away-by-the-city, but it effectively was a curb-side thrift store, as everyone knew to go curbside shopping that day. I think the only thing I picked up though, was a ladder. I used it in my apartment as a magazine rack; grad-school chic, baby! I really do love the idea of this curbside community shopping. Less waste for the landfill, and more use of items that otherwise would be thrown away! (Plus, can't beat that price.) While I'm personally paranoid about bugs and such in second-hand items, anything that doesn't have soft or permeable bits (such as soft furnishings), i.e. solid wood furniture or items like kids bikes or plastic kids furniture, I'd grab up in a heartbeat!